I had made plans with a friend to go with me to an RV show last weekend and I was pretty excited. She knows nothing about RVs or RVing and we were going to have a great time. Friday night I decided to go to Mapquest to figure out how to get there and to my surprise found out that the Monroe County Fairgrounds were in Michigan and I’m in Washington. The fairgrounds I was planning on going to is located in Monroe but it’s called the Evergreen State Fair. Now that I have that figured out I won’t be making that mistake again. I felt pretty silly leaving her a message that I wasn’t willing to drive to Michigan no matter how badly I wanted to go to an RV show. She thought it was pretty funny. Our backup plan was to go to RV dealerships, starting with a Class B dealership that I’d been to in the past. Only it wasn’t there, it’s a car dealership now. In fact, we couldn’t find a single Class B to look at. The area that I drove to, Fife, WA, used to have a ton of RV dealerships and there are fewer and fewer each time I go there and I find that depressing and sad. Surprisingly, there was one with a huge Grand Opening sign but they didn’t have any Class B’s so we just drove in and then right out. Last week was a frustrating week for me. I wanted to buy a USB cable for my new camera and went to the store where I bought it. The young lady waiting on me told that I’d have to buy a package of three. I told her that I only needed one so why would I buy three and I didn’t understand why they’d even offer it that way. She went and talked with someone and came back with a deal that I could buy one USB cable along with something that I’d never heard of and couldn’t get the gist as to why I’d need it. I then called around town and wasn’t able to find one. I don’t like buying online because I use a debit card and feel uncomfortable using it that way. I suppose I suffer from “I want it now” syndrome and don’t have the patience to order online. However, I still don’t have a cable and if I’d gone ahead and ordered online I’d probably have it by now. But, I have a one hour lesson on my camera tomorrow with the sales manager and I’m going to mention to him what happened with the USB cable and maybe he’ll sell me one. One would think that considering what I spent on the camera they’d just throw the cable in for free. Then I decided I wanted to get a beanbag for my TomTom so that I wouldn’t have to mount it permanently in my car and could transfer it to my future RV. You’re probably wondering why I was using Mapquest when I have a TomTom. I was going to use my TomTom for the first time because I wasn’t sure where the fairgrounds were in Monroe and have Mapquest as a backup in case I screwed up. I finally found the beanbag at Target. When I got home I realized that there’s a small hook to hold onto the beanbag that needs to be mounted onto the dash so it’s not really transferable. I guess I’ll hold off for my RV. My final frustration had to do with finding a replacement glass vial for my rain gauge. I forgot to bring it inside when we had really cold weather and the water in it froze and it broke. The nursery where I bought it doesn’t carry replacements so I went online. The glass vial costs $4 and with shipping it would be $12. I’m thinking I’m not going to be replacing the vial anytime soon at that price for shipping. Here’s more on the ongoing saga with the squirrels. It turns out that the location of the bird feeder was too handy for the squirrels. I got out my ladder and re-hung it so that they could no longer jump onto the bird feeder from the tree trunk. It’s kind of a pain for me because now I'll always have to get the ladder out to refill the feeder, but I was pretty proud of myself in keeping the squirrels away. Wrong, as you can see in this picture. Before leaving the house a few days ago I noticed a squirrel on top of the dome chomping away. I got my ladder out and went and checked and they were starting to chew through the hook holding the feeder and squirrel repellent dome. I took the whole thing down so that nobody could feed, birds and squirrels. I went to the hardware store looking for something to save the hook and ended up wrapping a rough piece of material around it. I haven’t seen a squirrel on the feeder lately so maybe I’ve won the battle. The good news is that I leave for Hawaii in eleven days!!!!!!!!!!! A friend from grad school is currently working on getting certified in EMDR (eye movement desensitization and reprocessing) and I'm her guinea pig. We've been meeting for quite awhile and she's been practicing with me. Since I've had a perfect life, no traumas, no issues, no abuse, nothing to regret from my past, it's been difficult for her to work with me. I mean, I come from a Catholic/military background so no issues...right? But today was a different day. She wanted me to think of a situation presenting difficulties in my life and I decided that wanting a Class A motorhome and being scared to death to drive one might be a good topic, so we went with it. It isn't like a counseling session so I wasn't sobbing or anything but I did have an AH HA moment, or as Nancy referred to it, it was a small t moment. Small t meaning a small trauma instead of TRAUMA. Apparently, back in the day (not that long ago), when I was in city bus driver school we went to some very narrow streets in Seattle to practice right hand turns. The buses had buttons on the left side of the floor for turn signals with a place for your foot to rest in between them. They weren't automatic and had to be held down throughout the turn. Then I had to remember to take my foot off of the button once the turn was completed, all the while remembering to pull forward so far before turning, don't hit the car coming towards you, etc., etc. with the instructor and two other students breathing down my neck. I only did this two times!! Those streets would scare me in my SUV and I'm in a city bus!!!! At the time it felt like TRAUMA but has simmered down to small t trauma, but trauma none the less. So it appears that driving that bus has gotten in my way and I think that's where the fear is coming from. I'll let you know because I'm going to a dealership tomorrow and drive a Class A. I think I'll start out with a Class B, then a C and then an A and report on how it went in another post. I've also been questioning why I want a Class A instead of a B or C. Is it because there's room for more stuff so I don't have to get rid of as much and can take more with me? Does it represent the difference between a McMansion and a rambler, the Class A being a McMansion and a Class B being a what...a tent...because I think a Class C would be a rambler in this analogy. Well, for me, it's the four windows and where the dining room is located. I love the floor plan and I think it would be a great vehicle to live in. I'm referring to the RV pictured on my blog...the one that instigated the "Four Windows with a View" blog name. So, enough of the debate or the questioning or whatever else you want to call it. Just go buy the thing. Oh, ok. I'm not sure how I'm going to make it until I leave for Hawaii on February 4th. I'm so sick of the gray and the dampness and the darkness up here. Day after day after day of it with no relief in sight. This is definitely my last winter in Seattle. I'm so looking forward to spring, so that I can start having garage sales and getting rid of stuff. I'm so under the weather and depressed and lethargic that it's hard to get anything done. No wonder I sound like a looney tunes on my post (I think I sound like a looney tunes, at least part of the time). My son called me this morning and informed that I'm going to be a grandmother!!! It still brings tears to my eyes as I type this. I'd given up on ever being a grandma so this is a happy day for me!!! Fortunately, I had a Silvers Sneakers exercise class this morning so I was able to inform everyone there and anyone else who came into my vicinity...now they know too whether they wanted to or not. Old habits die hard and I wanted to call my twin and parents but they're gone so I'll continue to tell everyone else. What tickles me is that I'm the first grandparent to be informed and since I have no grandchildren I think that's fair. My DILs parents already have three grandchildren so this is something they're used to I imagine. So, my first grandchild will be born in Germany and I'll probably earn a few miles on Lufthansa. I never have mentioned that I returned the camera that I bought at Costco. I just didn't want two lens to deal with so back it went. The camera on the left is the one I bought today and it's a Nikon D3100 with one lens. But this isn't the lens that came with it originally. Again, I just wanted one lens and the one I ended up with has wide angle and telephoto and I'm thrilled. I knew that I wanted more telephoto, or zoom as they call it in the directions, but to have wide angle also was too good to pass up. They kept the lens that came with the D3100 and took $150 off the price and that sure helped. It's an SLR so I have a lot of learning in store, but that's ok because I'm really excited about this camera. I was never as excited about the one I got at Costco. I'll get an hours worth of training next week at the camera shop where I bought this. They're winning and I'm ok with that. It's kind of funny to watch because while the squirrel eats from the bird feeder, the birds are down on the ground eating the food that the squirrels drop. Is there something bizarre about that picture, or what! I've learned that it's cheaper to let the squirrels eat the bird seed instead of buying the cob for them at $4 each, which they go through in two days. FYI...these pictures are not from my new camera. My trip to Hawaii is too far out. We have had the most awful weather and I'm sick of it and I want out of here. We had snow on Tuesday and it came too late at night to really enjoy. By the time I got up Wednesday it was pouring rain and most of the snow was gone and it was just ugly (see squirrel pictures). It's gray, gray, gray and so depressing. I heard that we had 3" of rain in 1 hour. AARGH!!!!! Thank you all for your comments. They were enlightening and confusing. Of course, when I set up my blog I had no idea what I was doing. Merikay stated in her email that I had word verification and I went ??? So before starting this post I went back and checked my settings and realized that I do have word verification and...according to Google, I don't see it...and they're right and that's why I didn't realize I had it. Again, not knowing what I was doing, I don't see comments by email but on my blog only. I didn't know comments could go to email. Now I understand the permission part and I won't be irritated any longer. I'm still using the first cell phone I bought so even if I wanted to I doubt that I could read emails on it. I'm kind of old fashioned and I don't want to be that available to anyone nor do I want to be able to read emails anywhere at anytime. I think it would drive me crazy. I'm also still in a "real" house and generally don't have internet problems. However, today I had a horrible time leaving comments on other blogs but I don't think that was the internet, but then, what do I know. So thanks again for all your comments. I have a question...why do some of you have your blogs set up so you have to approve comments before they show up on your blog? I haven't come across too many but it irritates me when I do and almost stops me from looking at the blog again, but I swallow my irritation and keep reading. I guess my irritation comes from wondering if I'm being censored and if someone doesn't like my comment they won't post it. I don't go back and check so I don't know if this happens or not. Now that I've asked the question maybe my irritation will go away when this happens to me again. I also hope this won't cause some of you to quit reading my blog having asked the question. I'm almost afraid the push the Publish Post button, but I'm going to "feel the fear and do it anyway"
He, is an RV salesman and I've sent an email and left a voicemail and haven't heard from him. He, is the salesman that I dealt with back in October and November regarding the Magellan RV that is an upgraded version of the RV with the floor plan that I want. It, the RV, has gone down in price $20,000 and it's still on the lot in San Diego. Having climbed the fence that was holding me in (see 1/4/11 post...Inside the Fence), as proven by planned trip to Hawaii, I'm on a roll. For some reason I decided to go online this morning and see if the RV was still available, not imagining that it would be and finding out that it is. My excitement level just about went through the roof and I immediately sent an email to Cory (RV salesman). When time went by with no response, I left a voicemail and still no response. Maybe it's his day off. Drat. I want to talk to him NOW. Having climbed the fence I'm ready to rock and roll and I can see myself on a plane to San Diego. But I need to talk to Cory first and he's not responding. See what happens when one (that would be moi) makes up their mind? First, a planned trip to Hawaii; second, a hoped for trip to San Diego to maybe purchase an RV. Geez, what's next? I guess that would be renting my house so that I can hit the road in the spring after Snoqualmie Pass loses all the snow that it currently has and any future snow (it's in the forecast). But, before that trip over the pass, there will be garage sales and packing and discarding and work, work, work. So, let's send positive vibes that Cory contacts me. 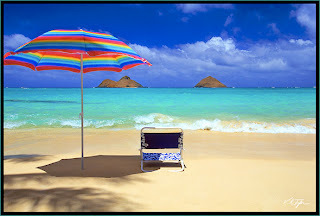 It's a done deal...I have reservations for Hawaii for me and my friend from Idaho. I'm so excited I can hardly stand myself!!! I haven't posted the last couple days because I've been emailing and talking on the phone to Nancy, my Idaho friend, trying to get things decided on. We're going to stay in a one bedroom condo with an ocean view and about a 10 minute walk through Fort DeRussy park to get to the ocean. Since Nancy has never been to Hawaii I suggested we go to Oahu since there's so much to do and who knows if we'll ever get back. I base that statement on the fact that the last time I flew to Hawaii it was on a 747. Remember them, those huge planes that looked like they weren't going to make it off the ground? Yep, that plane. This time we're going on a 767. As long as it's Boeing, I'm happy. The last time I went to Hawaii I was working at Boeing and some guy in the factory was making and selling t-shirts that said, If it's not Boeing, I'm not going. I was traveling with three other women who worked at Boeing and we all wore those t-shirts on the plane. Nancy and I also met at Boeing many, many years ago. I think my last post about the fence was rather cathartic for me because I had decided that I was going to Hawaii whether Nancy went or not. I'm glad she's going and I think we'll have a wonderful time. I also think this is where I start to do new and different things instead of remaining house bound. I really appreciate all the comments and I realize that I'm not alone nor am I the only person with fears. Thanks for sharing. A few years back when I attempted to start a smoking cessation business, I rented an office not too far from where I live and I met a lady who owned a travel agency. I went to her for the Hawaii trip and I think I'll pick her brain when I get back for what else is out there...until I get my RV and hit the road. When I went to her office this morning she was planning a trip for someone to go to cooking classes in Italy. I went online and I now know when the three RV shows in Western Washington are going to be and I'm going to all three of them. There's one in January, February and March and my trip to Hawaii is between two of them so I won't miss out. It might be hard to see, but my name is on that chair...that's my spot. That's where I'll be when I'm not doing the touristy stuff, of which I plan on doing a lot. I didn't make it to the Polynesian Cultural Center the last time I was there and I will make it this time. I want to go on a catamaran and a kayak. I'm going to go back to Sheree's (my travel agent) next week to find out what else is available for us to do while we're there. When I worked for a helicopter medivac company in Tucson, the director told me that his sister is a sculptor and did a sculpture of Jack Lord (Hawaii Five O) for the Hawaii Police Department. I think I'll go check it out. I just might run out of time with all the things I want to do. I know we won't be bored. 28 days until I fly to Hawaii!!!!!! “My life is a green pasture, bordered by a wooden fence. Each section represents one of my fears; these fears circumscribe my existence. I regularly visit the perimeter, testing my limits. Each fear that I accept makes my world a bit smaller. These words are from Thalia Zapatos, which I found in the back of her book A Journey of One’s Own: Uncommon Advice for the Independent Woman Traveler. I learned about this book when Kim mentioned them on her blog The Travels of Kimbopolo. My heart has been in my throat since I started reading the book and this quote slammed me on the side of my head so fiercely I’m surprised I’m still upright as I write this. I am being so challenged. I’m not sure that I’m even going to be able to explain the impact this book is having on me, but I’m going to try because I think I’ll learn a lot as I try to explain it. (And I immediately go blank). I’ve come to recognize two things lately: (1) I need to travel to places other than Tucson. I know Tucson inside and out and the challenge is gone; (2) I’m afraid to travel alone and that keeps me inside the wooden fence. I need to specify that I’m afraid to travel alone if I’m not going to Tucson (or Florida where I went to visit a friend). I'm wondering how this fear relates to RVing, but while that's not my focus right now, I won't ignore the possibility of a parallel problem. I can feel the fear in my gut. It’s there now as I’m writing this post. It feels like it could choke me if I don’t get a handle on it. I don’t like how I’m feeling. I want to go to Hawaii. I think I’ve mentioned that in other posts. I’ve talked to my friend in Idaho about going but that’s not looking very positive. I don’t have anyone else to ask. I've mentioned it to my son, but with a recent change of command at their base, with him having a new general to protect, he’s not sure when they can get away. I also get the feeling that he's not that interested but won't come out and tell me. So, what are my fears? I mean other than going to Hawaii alone??? Ok, here’s one. I’m alone at the beach and I want to go swimming. I have my camera, room key, car keys, etc., etc. What do I do with them when I’m in the water? Trusting that nobody will take them seems rather naïve and that’s not how I feel, I’m afraid someone will take them. Also, who's going to take pictures of me at the touristy spots??? See what I mean? Maybe I'm just making mountains out of molehills to stay inside the fence. Hmmm. I'm mentioning this because I know that a lot of you are able to think outside of the box and I'm afraid I'm stuck in the box right now, in this case, fence, because I'm using a fence analogy based on the quote at the start of this post. It's getting tiresome. I'm also closer to just buying tickets and going...alone. But I'm tired of doing alone and maybe that's a subject for a different post...or not. So folks, that's how it is. that goes in one year and out the other. It's a tad bit hazy, but I want to share the Olympic mountains with you as seen across Lake Washington. It's so seldom we can see them, let alone without clouds, and I think they're stunning. When the sun is out I can't think of a better place to be. So for me, 2010 ended on a high note because the sun was shining and 2011 is starting on a high note because the sun is shining. See how easy to please I am? Just give me sunshine and I'm a happy camper. I hope 2011 is a wonderful year for all you RVrs out there.